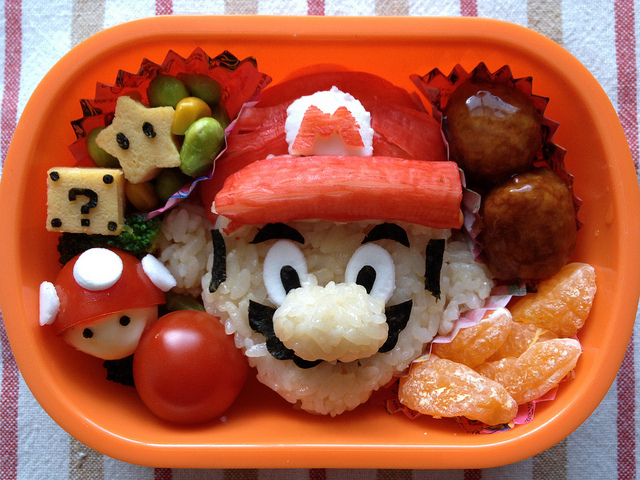 As you might know, kyara-ben (character bento) are elaborately arranged lunch boxes for small children, featuring manga/anime characters they love. Kyara-ben started becoming popular around 2007, and now in 2014 they are more than just a quick fad. Various kinds of special kyara-ben kits are appearing on the market one after another, and mothers throughout Japan are trying to create more and more elaborate kyara-ben for their kids’ lunches. Meanwhile, some kindergartens and preschools have recently decided to restrict bringing kyara-ben style lunches. But why? One mother says, “the other day, I made a kyara-ben of Winnie the Pooh for my son. But the face of Pooh got distorted a bit on the way to the kindergarten. One of his classmates remarked that the bento looked ‘disgusting!’ and made my child cry.” And, according to a kindergarten staff, children always want to show off their cute kyara-ben, and the children who don’t have kyara-ben tend to be left out. The more elaborate kyara-ben moms try to create, the more time and handwork they need. Foods sits out during lengthy preparation. They say it makes the risk of food poisoning higher. When moms try to make higher quality kyara-ben, they often sacrifice nutritious items for those that are particular shapes or colors. Thus the lunches sometimes lack enough nutritional variety for growing children. I kind of understand all the reasons listed above, but also think that Japanese people are sometimes far too sensitive about very small things. What do you think?